I was writing this as an entry to my diet journal, but as usual, it became long and involved enough to become its own post. On a lark, I decided to try the trendy butter-in-the-coffee thing. I like Dave Asprey. He’s the “Bulletproof Coffee” guy. Originally, I had an immediate disdain for him because I loathe the word “hacking” used in any context that doesn’t involve Oliver Wendell Jones. “Bio-hack” especially. No, I don’t want to “hack my sleep”, thank you. But some dudes I respect like him, so I have to listen to him, though I really have to review his science sources. I find a lot of it far-fetched or over-reaching in claims. If minor changes made such obvious beneficial differences, we would all be doing it. I think a lot of placebo is involved. That or you have to buy into his whole lifestyle, otherwise you make each individual effort null and void. But I reserve judgement, I promise. I like his bulletproof podcast and his interviewing technique but ultimately I find his diet plan too restrictive and diminishing of my quality of life. I appreciate his research and take it to heart and apply what I think is reasonable under the umbrella of Mark Sisson’s 80/20 rule. I keep in mind that much of his advice ties into some product that he sells. I don’t think he’s a huckster. I believe him and Mark Sisson when they say they want to make products they believe in available to others. But my goal is to show people that they can get healthy without spending money. No Weight Watchers, No DVD sets, no boxes of supplements, no mass-produced Gluten-free and no mass-produced “paleo” analogues of “normal” food, no Atkins Brand chocolate cake. A gym membership is strictly optional. I just want you to invest in higher-quality meat and vegetables and put a little time into some Youtube videos instead of your regular TV mush. And ain’t nothing cheaper than intermittent fasting, which is very healthy for you. In the long run you will save money- not only on fitness products and food, but how much will diabetes or cancer or a heart attack cost you or your loved ones once you’re gone? Once you are lean and feeling good and want to start advancing, Then feel free to dabble in Dave’s sub-atomic particle activated carbon, or Mark Sisson’s multi-vitamin supplements, or Sally Fallon’s $40 cod liver oil or a membership to a High Intensity Training gym or Dave’s super-computer systems that help you build a six-pack through guided imagery. I’m all for it if you’ve got the money, but insist that it is not required for health. Based on an old Tibetan tradition of putting Yak butter into tea, Dave Asprey wants you to drink a lot of coffee (mold-free coffee, and of course only his coffee is mold-free) and add cultured, grass-fed butter and MCT (Medium-Chain Triglyceride) oil. I’ll let you investigate his whole story and reasoning on your own if you are interested. There is a big debate out there as to whether you should use MCT oil or the whole food from which it comes, coconut oil. Dave of course sells “Brain Octane” oil, which is a super MCT oil that was probably “hacked” (rolleyes). This is all supposed to give you unbelievable energy and brain clarity. Of course you will find a million websites claiming this is all B.S. But not many of them are talking real science. There are claims that Dave’s experience can be chalked up to his Thyroid medication, or whatever. And of course he’s selling stuff, which bothers people. But to research this you really have to look at the science of coffee polyphenols and the science of how grass-fed butter makes them more bioavailable. Dave usually has hundreds of scientific papers sourced for his claims. To have one dipshit throw it all away because, “well, you know…Tibetans and Sherpas have altered mitochondria from living at high altitudes, so this is all bunk” is actually a little unintellectual, though it’s what some people want to hear. You have to refute all of his sources, not him personally. Do intense research and personal experiments, especially before you give people money but before you dismiss out of hand. Finding people ranting in ignorance is the easiest thing in the world. I have so many friends who have never read a book yet have all of the answers. Misguided vocal minorities are shaping your world every day, so take this seriously. I’m on the grass-fed butter bandwagon because of Sally Fallon and have been looking for a way to get more of it into my diet. I just happened to have a jar of coconut oil which is a normal grocery store item (actually my mom gave it to me). So what the heck. Let’s try it. MCT /Coconut oil is supposedly very ketogenic. I don’t know why I would want ketosis of dietary fats. I want the ketosis to use my spare tire & belly as fuel, not exogenous calories. But maybe it gives that metabolic pathway a boost. In regards to brain/mind clarity, I do know that the brain loves ketones. Pretty bad, let me tell you. That one still comes up from time to time when discussing our bad food decisions. Apparently the trick is to use a blender, not a spoon. You need emulsion. Most importantly!! 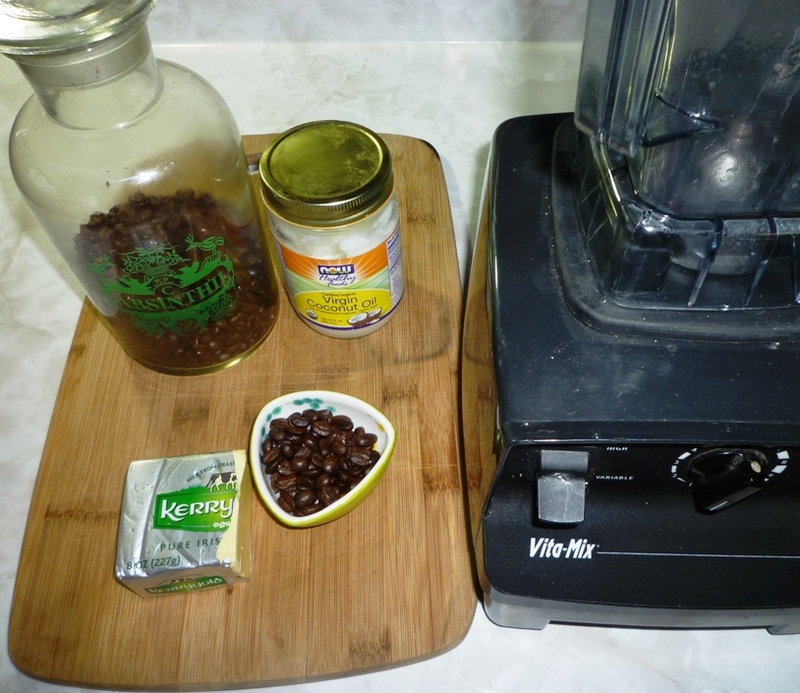 When you put hot liquids into a blender, they pressurize and blow the heck up. You must use something big like a Vitamix. I’ve never seen this mentioned in “Bulletproof” coffee discussions, but luckily, I’ve already blown up hot soup in the past and happen to have a Vitamix. The taste result: Not bad at all. I enjoy coffee purely as a gastronomic experience and will not tolerate a change in flavor at all. I don’t drink coffee as an “energy boost” as my body is not sensitive enough to sense it. I have made this coffee a few times now and decided that I don’t like the coconut oil in it. If I find a way to ingest a tablespoon of that right before drinking the coffee I’m fine. I also add a little heavy cream after blending. The physiological response: I honestly had the most energetic day of this year. I am not kidding. I shoveled the driveway, went to the gym and did a full run on the elliptical and was ready to do it all over again. So I did a full circuit of weight machines which I am normally very tepid with owing to the myriad joint injuries I’m currently suffering. Then I went swimming for half an hour and left the gym feeling great. This morning, my circulating ketone level is pegged and the scale is two pounds lighter than yesterday (possibly water weight from the intense workout depleted hydrated glycogen). Now, I didn’t feel energized during this. I wasn’t jittery. It’s just that nothing was fatiguing me. Normally I do a little work at the gym and I’m ready to hit the sauna. But I was flying. I wasn’t expecting a result from the coffee and as I mentioned, I didn’t feel energized. So I don’t think it was psychosomatic but you know what? Placebo is a very powerful drug. I don’t care if that’s it. Somehow I doubt it. Only prolonged experimentation with this will tell me. I don’t know if you could experience this as I did because I am already ketotic and feeling the perceived energy boost from the fact that insulin is not making me sluggish, stimulating anabolic hormonal pathways and blocking my leptin signalling. If you are currently metabolically tuned to burn carbs preferentially and insulin is ruling your system, I’m guessing you won’t have the results I had. But who knows. Let me know if you do. I’ll be making notes in the weight-loss journal.